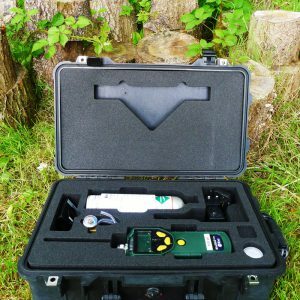 One of the most efficient technologies to detect the volatile organic compounds, VOCs for short, in the air is photoionization detection (PID). The mechanism of action of such equipment seems difficult, but only from the first sight. PID sensors are configured with ultraviolet lamp. The emitted light interacts with gas and vapor molecules and charges the atoms, turning them into cations and anions. The pump, also built into the device, makes the monitored air go through the sensor, which detects and measures the dangerous elements in rates parts per million or parts per billion. This way of detection involves the minimum volume of the air, so the process is very quick, but precision. The analytes are found with the help of electrical current they produce, and when they are detected, the monitor gives the sound, light and vibration signalization. PID MiniRAE Lite monitor, in spite of its small size, has a very efficient pump that takes the air tests from the distance up to 100 feet, and gives the result as quickly as a couple of seconds. It measures the analyzed elements in rates from 0 to 5000 parts per million. RAE Systems production is certified for safe operations in the USA and Canada. PID MiniRAE Lite has a mechanism of humidity compensation and the flashlight for signalization. With the help of the effective and precision configuration — the advantageous lamp, reliable software, solid firmware and durable materials, the miniRAE lite PID will perform its service for a long time without failures, protecting the working space accurately and reliably. It may find the signs of such hazardous materials, as alcohols, acrylates, ethers, bromides, aldehydes and many others, including some not organic substances. The portable PID monitors from miniRAE series are useful in ecology rehabilitation, leakage detection, agricultural enterprises, oil and gas industry, building constructions and production of medicines. They also provide the fire safety, detecting the flammable elements in the air, vapors of carbons and combustible gases. Due to its wearable and handy construction, it is effective and useful in any place, providing the personal and common security for any business.